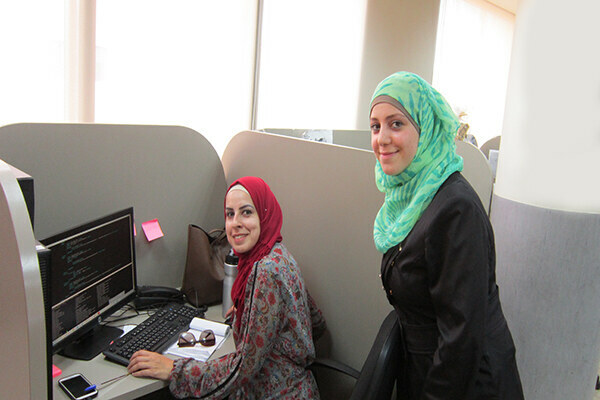 Palestine has established itself as one of the leaders of the IT Sector in the Middle East. Behind this rapid growth lies a powerful reality; Palestinian women have been earning more university degrees and have been increasing their workforce participation growth rate more than men. In the past few years, Palestine has seen the number of women graduating with a degree in engineering or computer science increase. As the highest educated population in the Middle East, Palestinians are already ahead of the curb in knowledge-based workforce participation, and women’s empowerment and workforce participation is at the forefront. Software engineering is not only an in-demand profession in the workforce, but also conducive for cutting down commutes. Working in IT enables greater flexibility in commuting because employees can work remotely on a need-basis. It is becoming more common for IT companies in the West Bank to have several offices across the West Bank, as to retain the best employees from across Palestine. Cutting down or cutting out commutes altogether make working in IT an appealing sector for women who would otherwise not be able to commute for their job. Companies across the West Bank realize that talent must be identified wherever it may be, and that whether the best candidate for the job is male or female is becoming more inconsequential. ASAL Technologies is one such equal opportunity employer, ensuring that all candidates are chosen based on merit. As it stands, over 25% of the ASAL employees are women, with this number set to near 50% in the next couple of years. In order to accommodate employees commuting from all across the West Bank to ASAL’s headquarters in Ramallah, ASAL has opened up a Nablus office, and is set to open a Hebron office next year. This ensures that female employees can continue to work for ASAL without the burden of commuting long hours. Offering several offices for employment, as well as the flexibility inherent in working in IT, frees women from having to choose between their family and career. If you’re living in the West Bank and want to find out more about employment opportunities at Asal Technologies, click here. Join the discussion on our Facebook page and let us know what you think.